SP Training has joined forces with Carlisle College to launch the Cumbria Construction Academy, which will deliver apprenticeship training to help address a skills shortage in the sector. The aim is to create apprenticeship jobs in the construction industry by helping employers take advantage of funded training through the Apprenticeship Levy. Carlisle College has launched a new groundworks apprenticeship programme that complements SP Training’s construction plant offer and the existing construction apprenticeship programmes offered by Carlisle College. Employers who wish to access the recently-launched government Apprenticeship Levy can take advantage of the funding that will deliver classroom and practical training set to meet their demands and requirements. Smaller construction companies who are not levy payers can also access this training, which in many cases will be fully funded. Practical training is carried out at SP Training’s premises at Carlisle Airport Business Park, with a bespoke-designed internal work environment and outdoor simulation area. 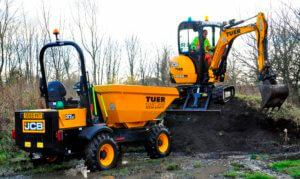 This is ideal for plant training and groundworks training such as excavating trenches and foundations or laying drains, all delivered in an environment which closely simulates a construction site. Training includes classroom delivery in areas such as manual handling, building materials technology, health and safety and the construction supply chain – ensuring a diverse and comprehensive syllabus. Working with a number of local businesses, including Story Contracting and Cubby Construction, the Construction Academy will help address the local skills shortage and ensure local businesses have the skilled workforce required to deliver the 10,000 new homes proposed under Carlisle City Council’s Garden City plans. Employers and candidates are welcome to contact either SP Training or Carlisle College where both partners have a range of funded opportunities available to support trainees.